In2Connect UK now offers Sullins Connector Solutions Dual Edge Connectors to facilitate end to end connection (boards in series) of 0.100″ and 0.156″ PCB boards. The new series is specifically engineered to facilitate board-to-board extensions, and to serve as board savers in board stacking and board extension applications without desoldering. 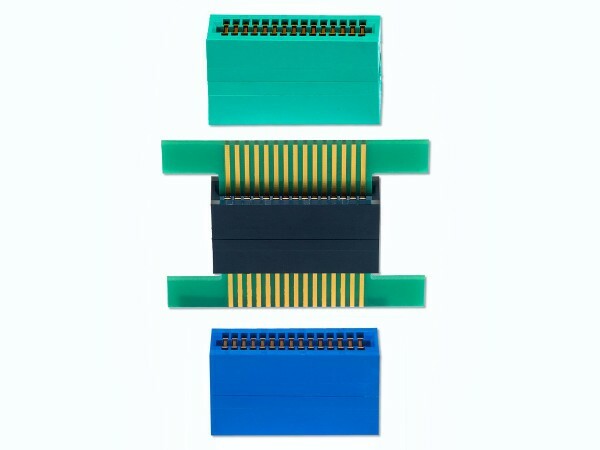 The standard dual-row, 0.100″ (2.54 mm) pitch connectors accept a 0.062″ (1.57 mm) thick PC board in both slots and are offered with from 5 to 60 contacts per row. Optionally available are 0.125″ (3.18 mm) and 0.156″ (3.96 mm) contact center version with 5 to 40 pins per row. Developed to deliver unsurpassed signal integrity, parts ensure PCBs are aligned at the centerline to enable a uniform signal path across the length of the connector. These robust and reliable devices tested well with HTOL (High Temperature Operating Life), HAST (Highly Accelerated Stress Test), and LTOL (Low Temperature Operating Life). They are supplied in straddle mount terminations, with flush mounting holes, or no mounting, to ensure optimal design flexibility. Dual Edge Connectors that support an operating temperature range of -65 degrees C to +150 degrees C are provided. Commonly employed in high-density, high-temperature, high-cycle life applications in which two 0.062″ PCBs need be connected in series, Sullins’ new Dual Edge Connectors are the ideal interface for R&D and life test applications. Devices may be confidently specified in an array of industrial, consumer, and commercial systems and products, and are most commonly used in test and burn-in oven facilities, electronic component testing, data storage servers, communications and networking equipment, medical devices and LED applications.